Here’s an archive of daily Umbrella Movement events from day one till day fifty-four. 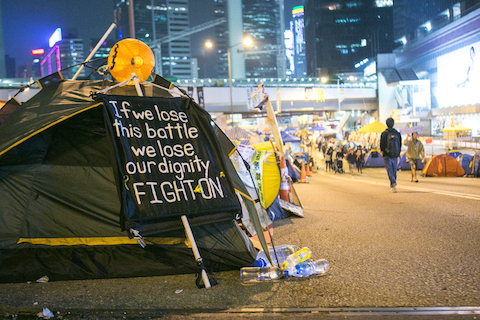 Follow the latest Occupy movement developments in Hong Kong at our new daily updates page. 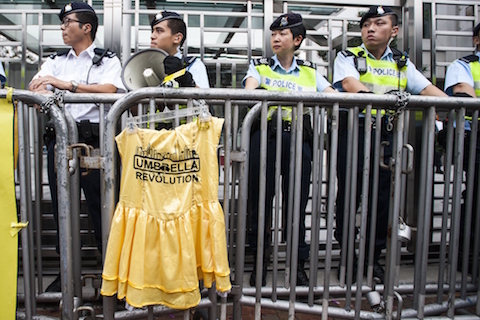 Want to know how the Umbrella Movement started and what’s it all about? Check out the key events leading up to the Sept. 28 demonstrations and our FAQ. – The Hong Kong people might be tired of the Umbrella Movement, according to polls conducted by universities. Media mogul Jimmy Lai, who owns the pro-democracy publication Apple Daily, also thinks its time for the protesters to retreat. – Scholarism leader Joshua Wong still refuses to clearly state if he condemns the LegCo attack. In an interview with an RTHK talk show on Thursday morning, Wong refused to state plainly what he though about the smashing of the legislature’s glass door despite being asked many time by the programme’s host, according to the South China Morning Post. Wong only conceded that the masked protesters’ acted irresponsibly. “What I would condemn was a lack of accountability among the masked protesters,” he said. Pan-democratic legislators, Occupy Central with Love and Peace, and the Hong Kong government have condemned the protesters, but Wong and other students leaders have refrained from doing so. Instead, they feel that the government should take responsibility for the LegCo attack. Joshua Wong also feels that the Occupy protests should continue even though a University of Hong Kong poll reveals more than 80 percent of Hong Kong people polled think the demonstrators should end their occupation. – British public service television broadcaster Channel 4 conducted an interview with a supposed triad member, “Mr Kong,” who claims that the Chinese Communist Party is behind the LegCo break-in. “Mr Kong” says that the triads are not interfering in the Occupy movement for political reasons, but for money, and that police won’t stop them because they have a “relationship” with the Hong Kong government and the police. – There is a post on HKGolden, a popular Hong Kong online forum, inciting protesters to assault the main stage in Admiralty on Friday, 10:30 p.m. Hong Kong time, and start a new main stage. 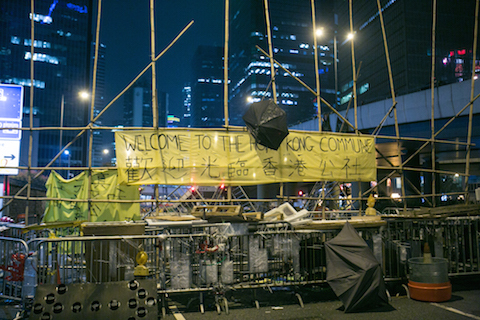 Radical protesters who stormed LegCo on Wednesday were also inspired by posts on HKGolden. – The Court of Appeal will decide whether to hear a challenge by an Occupy protesters against the Mong Kok injunction on Friday. This is the second appeal made to the court order. The first was rejected. – Chief Executive Leung Chun-ying once again claimed that the “involvement of external forces in ‘Occupy Central’ was not a mere speculation” in response to question at the Legislative Council meeting. – The Canadian House of Commons has adopted a motion supporting democratic freedoms in Hong Kong. 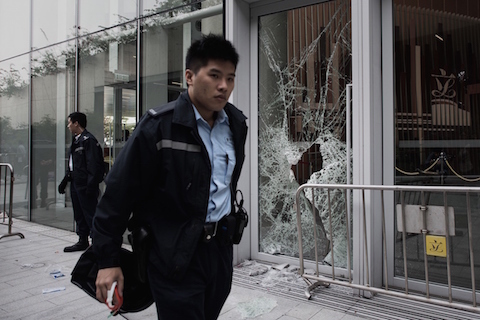 – A group of radical protesters smashed the glass door of the Hong Kong Legislative Council building. The protesters, who refer to themselves as “netizens,” claimed that they were storming LegCo to protest Internet Article 23, a bill that could curb online freedom, from being voted on later that day. This information was later revealed to be false because the bill is only slated for discussion in 2015. Police arrived on scene after the “netizens” broke the class and multiple scuffles broke out through the night. Although police used pepper spray and batons, they were restrained as compared to earlier incidents in Mong Kok and Causeway Bay. Four male protesters were arrested. This action has been condemned by student activist groups and pan-democratic legislators, as well as the police. The LegCo session scheduled for today has been postponed because of the attack. – The high court has briefed the plaintiffs, bailiffs, and police about the clearing of Mong Kok as per a court injunction taken out by two private taxi operators and a mini-bus company against the protesters. 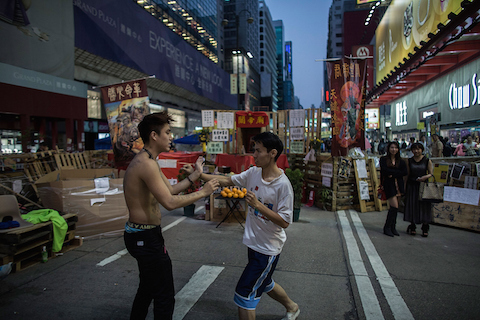 Television networks report that Argyle Street will be cleared on Tuesday, followed by Nathan Road on Wednesday. – A University of Hong Kong survey found that more young people are against the Occupy movement. 58 percent out of 513 people from the ages 18 to 29 polled were against the student-led movement, while in total, 83 percent of those polled felt that the protesters should end the occupation. 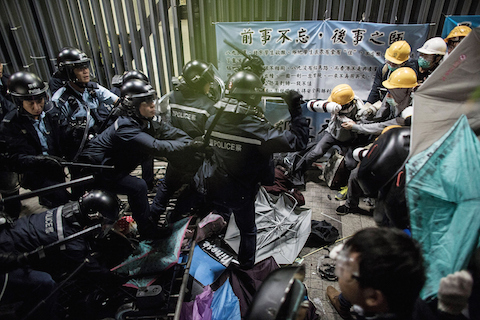 – The clearing of CITIC Tower went rather smoothly, with protesters allowing the bailiffs to remove the barricades as stated in the injunctions and nothing more. Scholarism convener Joshua Wong said that the court orders shouldn’t be abused to clear the wider Admiralty occupied area. Although the bailiffs didn’t respond after clearing the stipulated area, it was reported later that there won’t be any further clearances at Admiralty tomorrow. The government could erect a 3-meter high fence surrounding portions of the Legislative Council compound though. – The court injunction for the Mong Kok protest site have been published in the papers, which means that their enforcement could take place on Wednesday, Nov. 19. – Rimsky Yuen, the Secretary for Justice, says that the Hong Kong government won’t use the courts to resolve political problems in response to former Chief Justice Andrew Li’s remarks. 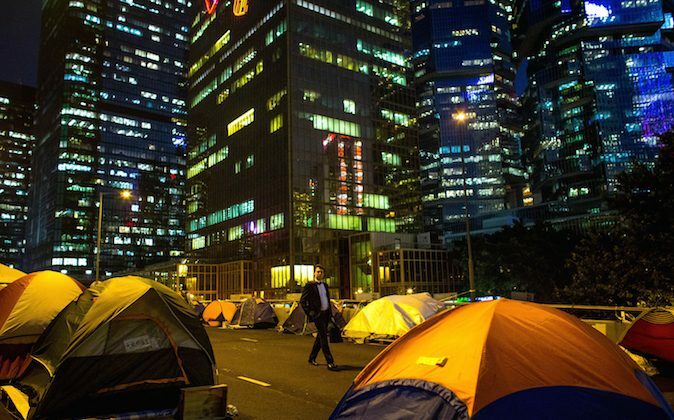 However, Yuen insists that the Occupy movement is a legal issue, and citizens have the right to turn to the courts. – The Chinese Communist Party supposedly has blacklisted 500 students from entering the mainland. 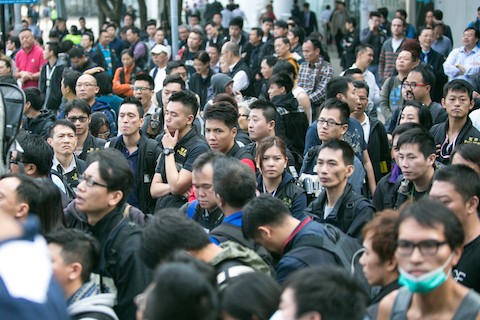 – The Hong Kong high court has authorized bailiffs and police to clear the protest site in Admiralty. In a press release, police announce that protesters should obey the court order, dismantle the barricades, pack up their personal belongings, and end their act of civil disobedience. – In a poll by the Chinese University of Hong Kong, about 67.4 percent of people feel that the pro-democracy protesters should end their occupation immediately. Those who oppose the Umbrella Movement have also rose to 43.5 percent from 35.5 percent in October. – Hong Kong’s Financial Secretary John Tsang wrote in a blog post that protesters should end their occupation now that they’ve reached the fifty day mark in order to retain the “moral high ground” and respect the rule of law. Tsang also reminded protesters that defying court orders is illegal. – In the face of increased opposition, Scholarism convener Joshua Wong says that the students will only stand down if there are better alternatives to the present political reforms being proposed. – James Tien, the pro-Beijing Hong Kong lawmaker who was expelled from the Chinese People’s Political Consultative Conference (CPPCC) for speaking up against Chief Executive Leung Chun-ying, once again criticized Leung. At RTHK’s City Forum program, Tien said that Leung doesn’t have a strategy to stop pan-democratic parties from blocking the government passing policies in the Legislative Council and properly resolve the pro-democracy impasse in the city. – Three more students have been blocked from entering the mainland. These students, one from Hong Kong Polytechnic University and the other two from Lingnan University, had supposedly helped with the Occupy protesters’ logistics. The Hong Kong Federation of Students has called on the government to explain the cancellation of students’ Home Return Permits, and if there is a “black list” of students. – Check out 50 days of Hong Kong in photos! – The Hong Kong Federation of Students released an open letter to Chinese premier Li Keqiang (Chinese version here, English here). In the letter, the student organization invited Premier Li to visit Hong Kong and learn the situation on the ground himself. Students also refuted charges in Chinese state-run media that “foreign forces” are manipulating the Umbrella Movement. – The Chinese Immigration Authority allegedly has a list of more than 500 students it will deny entry into the mainland regardless of whether they are participating in the occupation. Present and former HKFS and Scholarism members, as well as other student organization members, are supposedly on this list. – The president of Baptist University’s Students’ Union, Mio Chan, has urged fellow students not to accept graduation certificates from Vice-Chancellor Albert Chan on Monday’s graduation ceremony. Vice-Chancellor Chan had refused to give a certificate to a student holding up a yellow umbrella at an earlier ceremony. The university says that while it respects students’ freedom of expression, ceremonies are supposed to be solemn occasions, and participants need to respect others and the event. – Yvonne Leung, one of five HKFS leaders who participated in the student-government dialogue, said that police should not be taking the lead in enforcing the high court’s injunctions against the Occupy movement. – “Crouching Tiger, Hidden Dragon” star Chow Yun-fat finally gets the “Mr & Little Ms HK People” treatment. Here Chow is depicted in his “God of Gamblers” (a very popular Hong Kong comedy film) outfit. 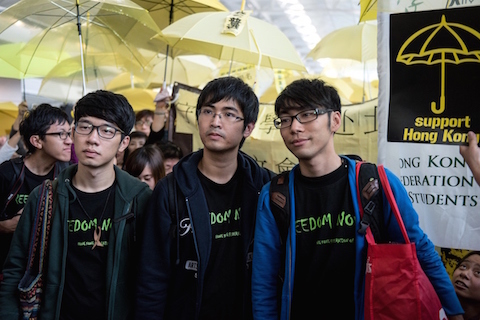 – Alex Chow, Eason Chung and Nathan Law from the Hong Kong Federation of Students were denied entry into China. About a hundred pro-democracy supporters and police were at the Hong Kong airport when Cathay Pacific staff told the HKFS representatives that their Home Re-entry Permits had been cancelled. The trio were looking to meet up with Chinese officials in Beijing to share the Hong Kong people’s opinions, as well as ask for greater democracy. Chief Secretary Carrie Lam said that the Central Government in Beijing is aware of Hongkongers’ hopes for universal suffrage and the “Chief Executive’s report on constitutional reform submitted to the Standing Committee had already reflected Hong Kong people’s aspirations for universal suffrage,” according to an official government press release. 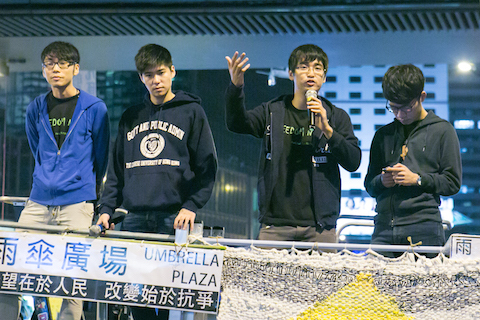 Later in the evening, Chow, Chung, and Law addressed the crowd at Admiralty. – The Hong Kong Court of Appeal rejected an Occupy protesters’ application to overturn injunctions given to two taxi associations and a public light bus company that seek the clearing of barricades in Mong Kok. The application, made by Dominic Fok, argues that the private transportation companies had failed to show that their businesses had suffered because of the occupation. – Pro-democracy publication Passion Times says they sustained severe denial-of-service attacks. – HKFS secretary general Alex Chow, Nathan Law and Eason Chung will be making the trip to Beijing on Saturday to seek an audience with Chinese officials. The trio, who are hoping to speak directly with Chinese regime premier Li Keqiang, have two objectives in mind, namely, to let the Chinese communist regime know the true public opinion of Hongkongers, and to strong protest the Chinese regime’s impositions on Hong Kong. – The Court of First Instance (Hong Kong’s High Court) has held up the injunction to clear the Occupy protest site in Mong Kok after the Court of Appeal questioned the wording of said injunction. A high court judge first issued the injunction order three weeks ago to a mini-bus company and taxi driver groups. The injunction barred protesters from portions of Nathan Road “near to” and between Argyle Street and Dundas Street. According to RTHK, Court of Appeal judges Mr. Justice Cheung and Mr. Justice Lam have called into question the term “near to,” and are also concerned about the “interim period” stated in the injuction. Senior Counsel Johnny Mok, who represents the transport groups, agreed that the injunction should not be served, advertised, and carried out for the time being. Senior Council Gladys Li, who represents the defendants, says that the plaintiffs have not proven that they have incurred economic damage because of the occupation of Mong Kok. Li also said that the Occupy movement case is a special one because many people are at risk of being detained if the injunction is carried out, and this could have constitutional and practical implications if the persons arrested are not found guilty of disobeying the terms of the court order. Mr. Justice Lam and Mr. Justice Cheung believe that the court will give a decision on Saturday noon. There is no word yet about whether the Admiralty injunction has been approved. – Hong Kong Federation of Students (HKFS) deputy secretary general Lester Shum says that the student organization will stick to its original plan to go to Beijing on Saturday to request a meeting with Chinese officials. Chow adds that the HKFS will cancel the trip if Hong Kong police move in to drive out the protesters before they fly on Nov. 15 because the police action will be a clear sign that the central government doesn’t wish to listen to Hongkonger’s appeals. – Rita Fan, the Hong Kong representative to the Chinese legislature, criticized the HKFS students in a strongly worded letter after they announced plans to meet Chinese officials in Beijing. – Johannes Chan, Dean of the University of Hong Kong’s Faculty of Law, and Mr. Justice Henry Litton, non-permanent judge of the Court of Final Appeal, question the high court injunctions against the Occupy movement. 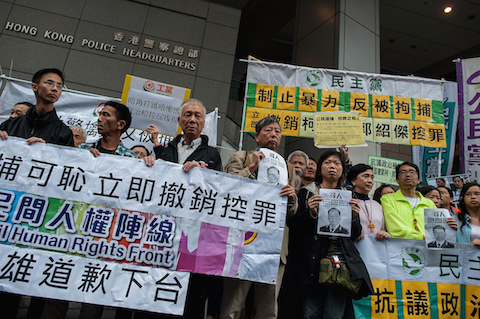 – Hong Kong’s high court has rejected protesters’ appeals regarding the injunctions. Police are expected to assist bailiffs in clearing the protest sites on Friday at the earliest. – Two Occupy Central marshals were arrested on charges of “fighting in a public space” after they restrained three men who attacked media mogul Jimmy Lai yesterday. Protesters gathered at the police station to call for their release, and they were eventually released on bail. – The Umbrella Movement Tents Population Census Facebook page has another update of the tent count as of Nov. 11. Post by 雨傘運動營口普查 Umbrella Movement Tents Population Census. 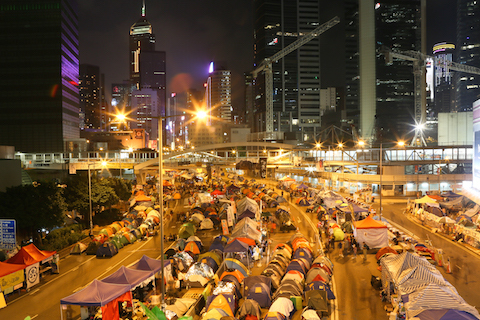 There are currently 2197 tents in the Admiralty and Central district. It is unclear how many tents are in Mong Kok and Causeway Bay. – At a press conference at the APEC meetings in Beijing, Chinese leader Xi Jinping says that the Occupy movement is illegal under Hong Kong law. Xi also says that the central government won’t interfere in Hong Kong’s affairs, and suggests that there won’t be a violent clearing of the occupied sites. – As APEC draws to a close and the Hong Kong government showing signs that they are about to move in to clear the protesters and make arrests, leaders from various protest groups have stepped up to share their plans when police eventually show up. Occupy Central organizers Benny Tai, Chan Kin Man and Chu Yiu Ming announce that they will turn themselves over to the police on Nov. 21. Tai had earlier insisted that the Occupy Central protests have not undermined the rule of law in Hong Kong. Scholarism convener Joshua Wong says he will stay in the occupied area when the police move in, and is prepared to be arrested. Likewise, Hong Kong Federation of Students deputy secretary general Lester Shum says that the student organization’s leaders won’t leave the areas if police move in, will accept arrest, and state their case of civil disobedience in court. Shum also hopes to explain why the HKFS chose civil disobedience via promotion stations in communities. – Apple Daily owner Jimmy Lai was splashed with animal organs at the Admiralty protest site by three men. The attackers were apprehended by members of the crowd and were later handled over to the police, who arrested them. 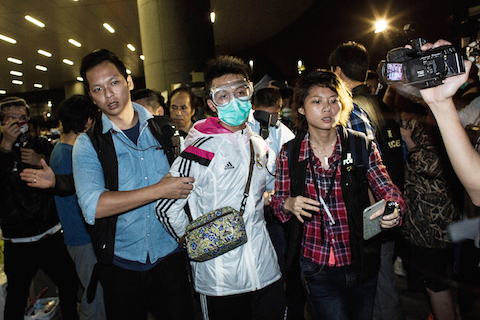 Ming Pao reports the two Occupy protesters who helped apprehend the assailants were later arrested. – Occupy supporter and former government surveyor Benny Mok has finally ended his hunger strike. The 51-year-old spent 40 days outside the government headquarters in Admiralty without food, subsisting on only saline solution because he is a diabetic. In total, Mok lost 30 pounds. According to Apple Daily, Hong Kong’s “Mr. Hungry” says he won’t hesitate to go on another hunger strike if the government tries to clear the students out by force or attempts to defame them. In the mean time, Mok is thinking about preparing food for those at the protest sites. – Reports suggest that about 7,000 police officers will be mobilized to drive protesters off the streets after the APEC summit ends on Wednesday. – The Hong Kong Federation of Students has written an open letter to the National People’s Congress (NPC) deputy Rita Fan requesting her assistance in arranging a meeting with Chinese officials in Beijing. However, Priscilla Lau, a Hong Kong delegate to the NPC, says there’s no chance of a meeting and that students should go home. – Most Western media report that Chinese leader Xi Jinping has backed beleaguered Hong Kong Chief Executive Leung Chun-ying. The meaning of this is actually rather ambiguous and can be read in a number of ways, but it definitely cannot be seen as Xi showing clear support for Leung. Quite the contrary, Xi’s statement could be a subtle warning to Leung and the pro-Jiang Zemin faction which he belongs to: if the Hong Kong situation is mishandled, they’re out. See the FAQ section for more information about the on-going struggle between the Xi Jinping and Jiang Zemin factions. – Student groups and pan-democrats held a three-hour meeting to decide if the lawmakers should go ahead with a mass walkout to force a by-election, but no consensus was reached. Another meeting has been set for Nov. 20. – Tonya Tai, daughter of Occupy Central with Love and Peace co-founder Benny Tai, wrote about her father in an article on inmediahk.net. In the article, which got more than 32,000 Facebook “likes,” Tonya said she is proud of her father’s “selflessness” and said that it pained her to see his greying hair and hear his hoarse voice since the Occupy movement took off. 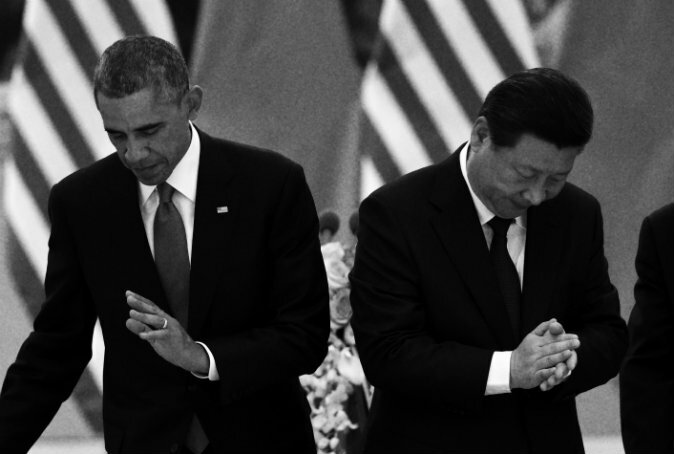 That being said, Obama hopes that “violence is avoided” in Hong Kong. – The world will soon know if the Hong Kong police resorts to violence again as the Hong Kong High Court has approved injunctions to clear the occupied sites, including the use of bailiffs to carry out the order. Hong Kong police have allegedly been spotted surveying the protest sites. Netizens are predicting that the police will move in after the APEC meetings end on Tuesday, Nov. 11. 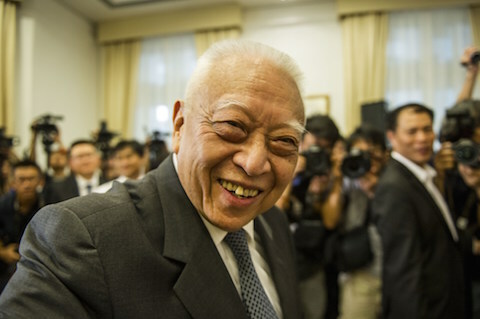 – Former Hong Kong Chief Executive Tung Chee-hwa sets up a think-tank, “Our Hong Kong Foundation,” with 88 consultants. Tung claims that the groups’ top priority is to find a solution to the Occupy Central protests, as well as nurture political talent in Hong Kong. Earlier, Tung had said he won’t be a go-between for the Hong Kong Federation of Students (HKFS) and the Chinese regime officials should the HKFS leaders go to Beijing for direct negotiations. – Scholarism convener Joshua Wong explains an incident that took place on the main stage in Admiralty on his Facebook page. Apparently, some protesters were prevented from going up to the main stage to speak because they disagreed with the Hong Kong Federation of Students (HKFS) and Scholarism, two prominent student bodies that largely control the main stage. Admiralty over a month into the protests. Some protesters are planning to occupy the UK Consulate in hopes of getting the British to clarify the agreement they made with China prior to Hong Kong’s handover. 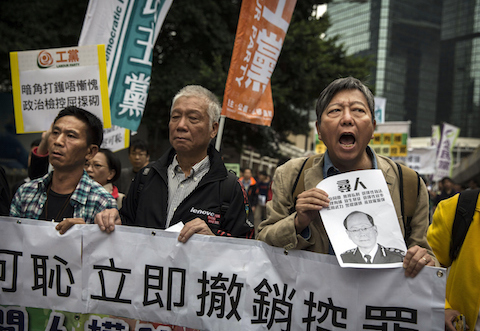 Under the eyes of police, a few hundred protesters marched from Central to the China Liaison Office. They fastened yellow ribbons to barricades surrounding the building. Student leader Joshua Wong has told protesters and the press that more discussion is needed before the Occupy protests can end. 25 years after the fall of the Berlin Wall, award-winning Japanese novelist Haruki Murakami has given warm support to the protesters in Hong Kong, comparing them to the people of East Germany who stood up for democracy in 1989. 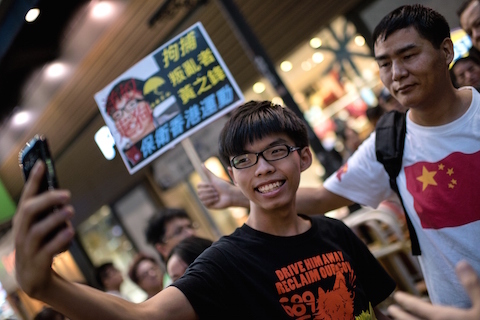 A member of Scholarism, the group led by student leader Joshua Wong, has been denied entry into China. Student leaders from Occupy are trying to arrange a visit to Beijing in hopes of negotiating with the central Chinese government. Google CEO and known critic of the Chinese regime Eric Schmidt has visited the protest sit in Admiralty. In 2010 Google left China due to censorship and hacking by the Chinese government. Over a thousand officers are reportedly training for a mass crackdown at the Wong Chuk Hang Police Academy. Alex Chow, one of the protest leaders, has said that the movement may last until next spring, depending on when legislative reform can be implemented by the Hong Kong government. The focus now is gaining public support, he said. 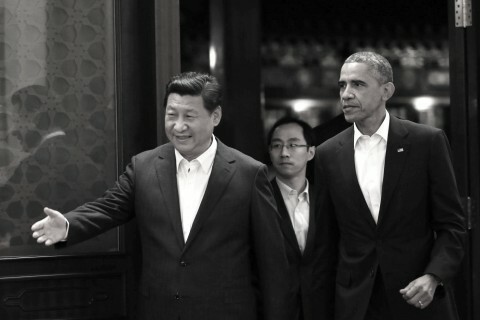 When or if student representatives will go to Beijing is still unclear. Artists have depicted a number of famous figures, past and present, as supporters of the Umbrella Movement. After last night’s and this morning’s clashes between police and protesters, Argyle St. in Mong Kok remains in pro-democratic hands. Chris Patten, the last governor of Hong Kong when it was still a colony, has said that the British did a poor job of introducing democracy there. Though police administration has earlier rebuked officers for wearing yellow ribbons (pro-Occupy) on the grounds that they are not part of the standard police uniform, today police chiefs have said that officers wearing blue anti-Occupy ribbons is an appropriate expression of their right to free speech. Protesters have criticized this hypocrisy. Read here for a more detailed look at the police actions that started in the evening today. Police have begun to move in Mong Kok. Arrests made. Police just arrested a guy in Mong Kok. Heard lots of yelling then saw police marching him into a van. Remember, remember the 5th of November: about 50 people wearing Guy Fawkes masks have appeared in Admiralty to support the protesters. Apple Daily has reported that representatives from the Federation of Students have made plans to travel to Beijing on Friday, Nov. 7. Their arrival coinciding with the upcoming Asia-Pacific Economic Cooperation (APEC) summit, they hope to to meet with central government officials and obtain a response to the student body’s call to reform Hong Kong’s electoral system. According to the South China Morning Post, travelers from Hong Kong have been asked whether they have umbrellas upon arrival at the airport in Beijing. A “support our police” petition, commonly misconstrued by its organizers and pro-Beijing media to be an “anti-Occupy” petition, has been submitted to Hong Kong’s Chief Secretary Carrie Lam. Max Lau, a Scholarism leader, has criticized Lam for the inclusion of Robert Chow’s “Support our police” petition in her official report. Lau says it is an inaccurate representation of popular opinion. Zhou Fengsuo, who took part in the 1989 Tiananmen protests, has expressed his support for the Occupy Movement. He sees “the future of China’s democracy in Hong Kong”. Robert Chow, of the anti-Occupy camp, has been criticized for comparing the Umbrella Movement to the Japanese occupation. “We have in total two occupation: the first is when Japan occupied Hong Kong, and the second time is this time,” he said. Anti-Occupy Rally sees mostly infirm and elderly. According to Joshua Wong, a student leader, the ability of the anti-Occupy leader Robert Chow to move through the Admiralty protest site without trouble proves the nonviolent and non-disruptive nature of the Umbrella Movement. Groups of elderly people being escorted to the bathroom. The number of tents at Nathan Road in Mong Kok has increased by a sixth since Oct. 31. The number of anti-Occupy protesters arrested by the police is over 300 for the duration of the Umbrella Movement. An article published on BBC Newslight has met with widespread criticism for its inaccurate portrayal of the Umbrella Movement. 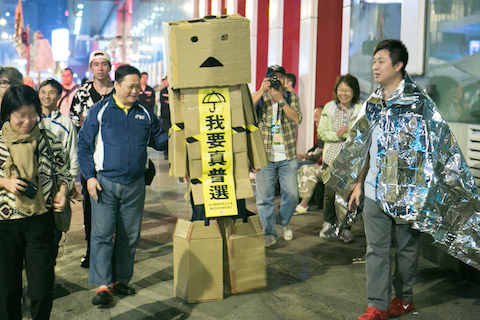 Occupy Central has urged BBC to remove the story. High school students have joined in solidarity with the Umbrella Movement protesters. Are the Hong Kong police engineering an escalation? Here are the main events leading up to the Umbrella Movement. In recent articles, Hong Kong magazines reported how the faction of Jiang Zemin sought to create chaos in the city, eventually leading to a Tiananmen Square-style massacre.